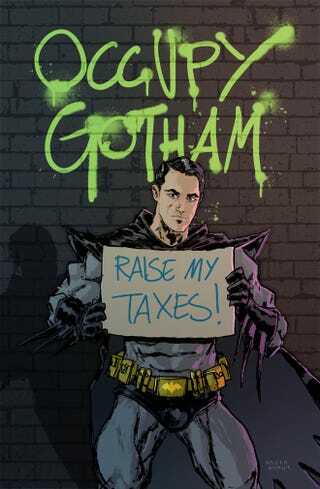 How would Batman respond to Occupy Wall Street? [A]ccording to a person briefed on actors' schedules who requested anonymity because production details were being kept confidential, cast members have been told the shoot could include scenes shot at the Occupy Wall Street protests. New York filming for The Dark Knight Rises kicks off October 29. Gotham City is perpetually embroiled in some sort of high-level malfeasance, so protestors aren't that much of a stretch. It remains to be seen whether Batman himself will stop by, an appearance which could drum up Radiohead-grade levels of pandemonium. Spotted on Slashfilm. Artwork by Anjinan Anhut.